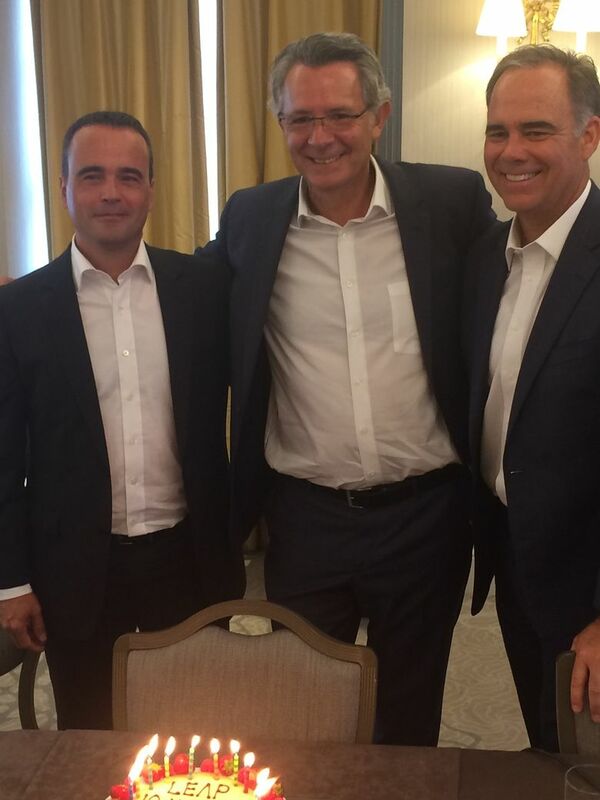 In London on Saturday, CFM executive VP Sebastien Imbourg, CEO Gaël Méheust; and executive VP Allen Paxson, celebrate the 10 years since the LEAP engine was launched. Ahead of the Farnborough Air Show, CFM executives celebrated a decade since the highly successful LEAP engine was announced, also at Farnborough. They outlined plans to double production by 2020 and vowed to have a new engine for Boeing if it launches a 797 jet. LONDON — Boeing’s new 737 MAX has so far escaped this year’s engine curse. Outside assembly plants in France and Germany, more than 80 parked Airbus A320neo airplanes remain engine-less, while around the world several dozen Boeing 787 Dreamliners are still grounded awaiting engine repairs. On Saturday in London, though, CFM International — the 50-50 joint venture between GE and Safran of France — gave an upbeat report on its LEAP engine, the exclusive powerplant on the MAX and the one that powers 58 percent of the rival Airbus A320neo planes. CFM’s leadership team said they’ll build 1,100 LEAP engines this year and plan to double that by 2020, a production challenge that they said precludes them from considering until next year requests from Airbus and Boeing to raise the rate even higher. Nevertheless, because in the relentlessly competitive engine world they must always think ahead to the next new plane, they also said that if Boeing does proceed with its proposed New Mid-market Airplane (NMA), CFM will offer a new engine. More somberly, CFM’s leaders also spoke of their response to the inflight explosion of an older CFM-56 engine on a Southwest Airlines 737 that killed a passenger in April. At a press briefing ahead of the 2018 Farnborough Air Show, the three-man executive team that heads CFM — chief executive Gaël Méheust; executive vice president representing Safran, Sebastien Imbourg; and executive vice president representing GE, Allen Paxson — blew out the candles on a cake to mark the 10 years since the LEAP was announced in 2008 at Farnborough. In that decade, the LEAP design has delivered the promised 15 percent boost in fuel efficiency and production has ramped up at an unprecedented speed to match the record production levels of single-aisle jets at Airbus and Boeing. Three quarters of the new narrowbody jets now rolling out from the two manufacturers are powered by a LEAP engine. A day earlier, CFM delivered the 1,000th LEAP engine to an airline. Altogether the company has won more than 15,000 firm orders and commitments. Around the world, the LEAP is powering 385 in-service aircraft and getting them into the air on schedule 96 percent of the time. The rapid ramp-up did create some problems in the LEAP supply chain. Some suppliers found they couldn’t initially produce their components at the required rate and LEAP production was up to six weeks behind schedule this year. That accounted for a portion of those grounded A320neos, though most were due to delivery delays and technical glitches with the Pratt & Whitney geared turbofan, the other engine on the neo. Boeing’s MAX program, running a year behind the Airbus program and so not ramped up as much, has been largely unaffected. Though engines have been arriving late, Boeing says no airplane deliveries have been late. On Saturday, CFM offered assurances that it has worked with suppliers to improve the forging and machining of parts and has managed to accelerate engine production so that the total number of engines delivered is projected to catch up with the original plan within months. Imbourg and Paxson also described some technical glitches they’ve had to overcome. Various disks and valves were found inadequate in early engines and were replaced and retrofitted. Airlines were minimally affected because CFM provided spare engines in place of those taken off for repair. The most difficult and widespread issue arose in the hottest part of the engine around a high-pressure turbine disk. The thin protective coating on a ceramic composite lining that shrouds the disk was wearing off too soon. The wear of an engine causes the temperature of the exhaust gas to rise with each flight, which in time reduces fuel efficiency slightly. After some 6 to 9 years of service a typical single-aisle engine must be taken off the wing for maintenance to restore the performance. The airlines didn’t notice, but because CFM was minutely tracking the LEAP’s performance in service, it realized that the gradual disintegration of this coating, which is just 35 thousandths of an inch thick, was causing the exhaust temperature to rise faster than expected. Though this wasn’t a safety issue, it did threaten the engine’s durability. It could mean having to take it off the wing earlier for maintenance. So CFM developed a new, slightly thinner coating that will adhere better to the ceramic composite shroud. All the engines previously produced will have this improvement retrofitted at their next regular maintenance shop visit. Aside from the LEAP’s upbeat report card, the CFM team briefly addressed other questions. They confirmed their intention to offer an engine for the NMA, often referred to as Boeing’s proposed 797. That engine will blend the latest technology breakthroughs from both the LEAP and GE’s newest widebody jet engine, the GE-9X that it’s developed for the 777X. “Should there be a need for an aircraft in that category, there will be a CFM engine,” Paxson said confidently. On the timing of that project, Boeing is sticking to its promise of an entry into service in 2025, while Airbus insists that the engine makers won’t have the technology needed for a new engine ready until 2030. Paxson was enigmatic on that difference of opinion, offering no timeframe, only another assurance: “We wouldn’t commit to anything we couldn’t do,” he said. On Airbus’s rumored interest in spiking A320neo production as high as 70 jets per month, with Boeing also publicly weighing taking its 737 MAX lines higher than 60 jets per month, Imbourg reiterated the recent comments of GE Aviation boss David Joyce and Safran boss Philippe Petitcolin that CFM must first handle the current production ramp and won’t even think about further rate hikes until next year. Finally, Imbourg answered questions about Southwest Flight 1380 and the fatal blowout of the CFM-56 engine, the predecessor to the LEAP, which has been in service since 1997 and previously had a stellar record of reliability. That terrifying accident happened when a fan blade broke off and tore the engine cowling apart, with some of the metal debris knocking out a window in the fuselage. Inspections of fan blades on CFM-56 engines were ordered afterwards by the Federal Aviation Administration, though many asked why such inspections hadn’t been ordered after a similar, though non-fatal, fan blade break 18 months earlier on another Southwest 737. While not permitted by National Transportation Safety Board (NTSB) rules to comment on such aspects of the ongoing investigation, Imbourg described the all-out effort by the airlines and CFM worldwide to inspect every fan blade after the April death. Unlike some critical engine parts, the 24 individual fan blades on every CFM-56 did not have to be individually tracked through the system. But Imbourg said the engine-maker now has “a worldwide map of the blades,” and is able to say where every blade that left the factory is now and when it was last inspected. Expressing sympathy for the family of the woman killed, he also conveyed the sense of responsibility commonly felt by those who work in aerospace. “It was a tragedy for all the teams inside CFM,” Imbourg said.